With the infrared heater ECO Light / Heat / Advertisement IP24 without switch by Solamagic you can turn every service area of your gastronomy business into a cosy spot - with the combination of snugly direct heat, pleasant lighting and illuminated advertisement in your restaurant or hotel you are always one step ahead of your competitors. The Solamagic ECO Light / Heat / Advertisement heater offers all advantages of innovative ECO+ infrared short wavelength technology, at the same time leaving as much room as possible for individual use of the heater. The heater is available in three versions with 200, 2800 and 4000 Watt power with two top-notch durable HeLen infrared lamps, depending on the area that needs to be heated from 10 to 25 square metres. Two mounts allow for the device to be installed to wall as well as ceilings, thanks to the free choice of colour it can be perfectly integrated into your interior concept. However, the special highlight of the Solamagic ECO Light / Heat / Advertisement is definitely the eye-catching illuminated advertising space for self-promoting or advertising for a sponsor. Dimensions (W x H) advertising space: 44.6 x 11.2 cm // 17.56" x 4.41"
Dimensions (W x H x D) with holder: 134 x 230 x 176 cm // 52.75" x 90.55" x 69.29"
Recommended installation height ca. 220 - 350 cm / 86.61" - 137.79"
Distance to heated surface: min. 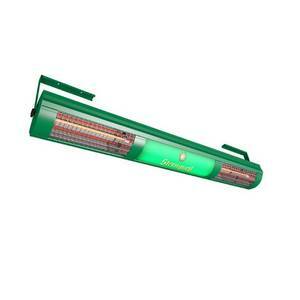 70 cm / 27.65"
Every heater of this series is made to the customer's specification in colour and graphics. For this we only need the desired RAL colour that shall be used for the powder coating of the housing as well as a draft for the advertising space (via email). Please let us know about your requested RAL code in the comment box during the ordering process. As the item will be custom-made, rights of revocation do not apply. The delivery time starts with the receipt of the draft. The included lamps are to be used only in combination with the infrared heaters in order to create heat, and are suitable neither for domestic lighting or any other different use.